Lucky 3-year-old Annabell took her friends down to the woods for an enchanting birthday party, organised by Kiss Me Kate Events. 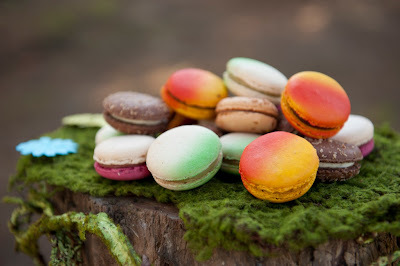 There are so many fun elements to this party - I adore those little lamington-topped mushrooms and the macarons that could pass for fungi! Birthday: 3 year old girl's birthday party for Annabell. Organised by: Kiss Me Kate Events. Location: The party was held in parkland area in the suburb of Balwyn, Melbourne. 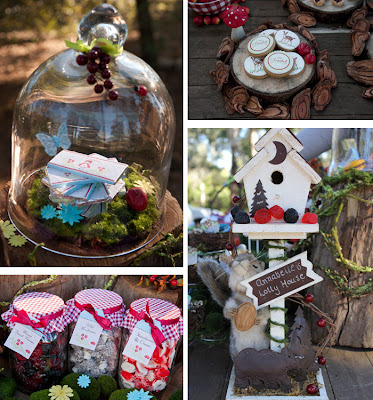 Theme: Enchanted Forest (Red Riding Hood Inspired) - a themed party package from Kiss Me Kate Events. Invitation: Created by Andersruff Custom designs. Cake: The birthday cake was designed and baked by Kate Brown of Kiss Me Kate Events. The icing was made from a meringue frosting which gave the cake a lucious texture. The cake was decorated with edible toad stools and butteflies. 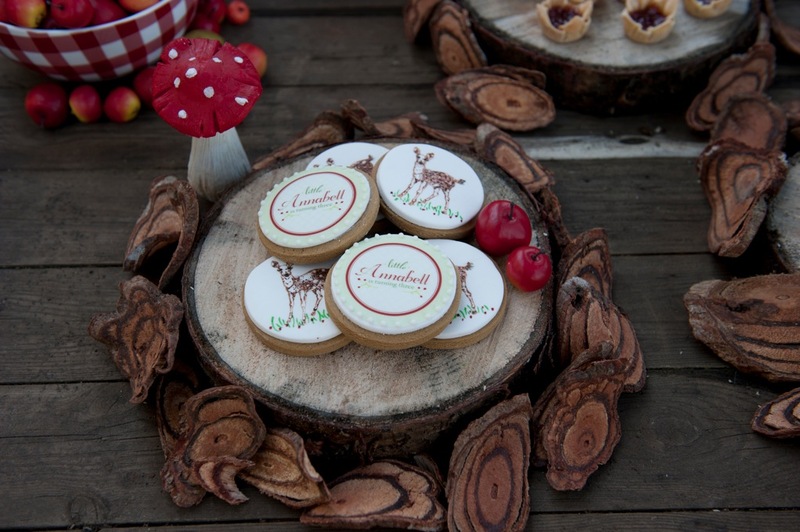 Party food: The cookies, cupcakes, jam tarts were baked by Kate Brown of Kiss Me Kate Events. The remaining dessert items which included personalised chocolate bars, personalised fruit pop drink bottles, bite size lamington fingers, macarons, mushroom meringues and assorted candy were sourced and styled by Yolanda Cerra, stylist for Kiss Me Kate Events. Decorations: The printables include a personalised welcome party sign, bunting, and food labels, created by Andersruff Custom Designs. Other decorative items include wood stumps and glass cloche bells. Sliced wood blocks were used as serving platters. 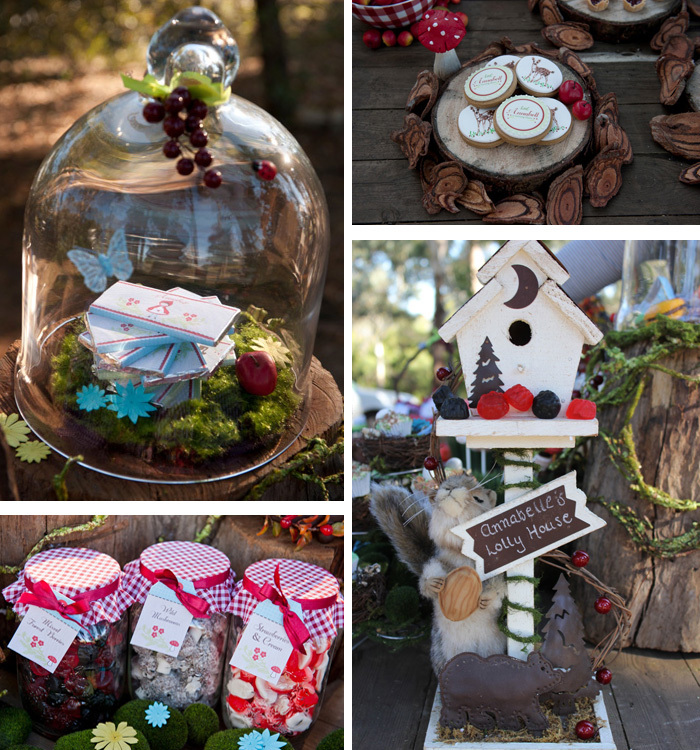 A wooden basket was used to house the assorted candy jars and pine cones, faux apples and a scattering of paper flowers were used to bring a touch of forest floor coverings to the dessert table. 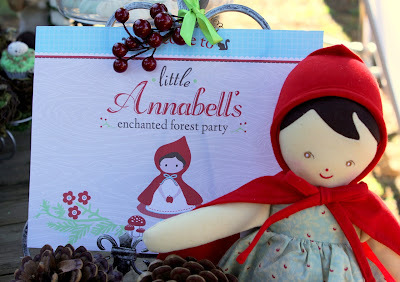 Tips: Annabell's parents wanted the party outdoors and in a setting that felt like you were in the forest. 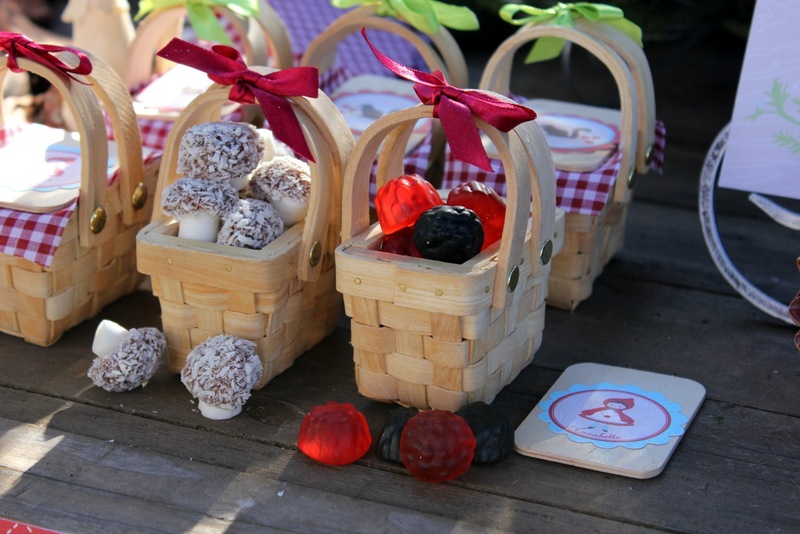 They chose a parkland area in their neighbourhood of Balwyn, VIC to set up the dessert table and the children had plenty of space to run around and have fun. 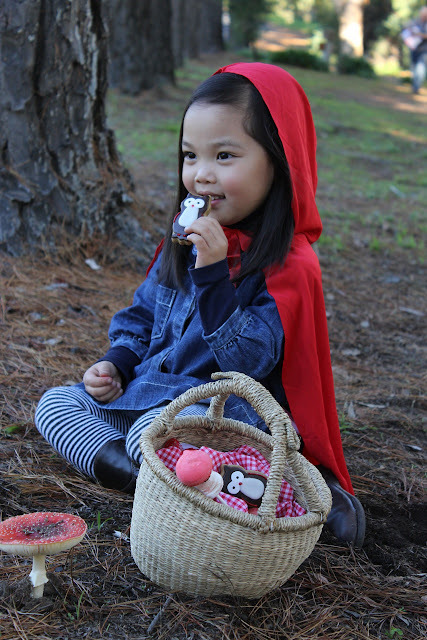 Something Special: Although it was not a costume party, little Annabell looked adorable in her little red riding hood cape and really enjoyed being in character for the afternoon. Thank you Yolanda and Kate for sharing this fairytale birthday party with us. For more gorgeous parties head over to their party and event styling business Kiss Me Kate Events. This is such a special party with so many little details. That is one delightful and charming little party for a cute little girl. She must have been thrilled. It's so sweet, and all the details so beautifully thought out and executed.